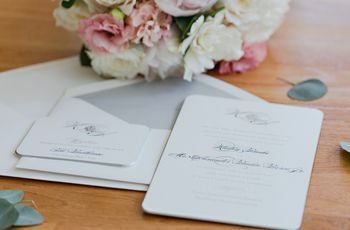 Check out these wedding invitation wording etiquette tips. When it comes to your wedding invitations, the decision-making doesn’t stop at choosing your design and paper colors. In fact, the biggest impression you’ll make with your invites might not be how they look at all, but what they say! That’s because, traditionally, wedding invitation wording reveals who was involved with paying for your wedding (or, in more delicate language, who is “hosting” it). If your wedding was a group effort and/or you’re a non-traditionalist who doesn’t feel like playing into these types of “wedding rules,” that’s totally ok! Feel free to word your invite however you like. 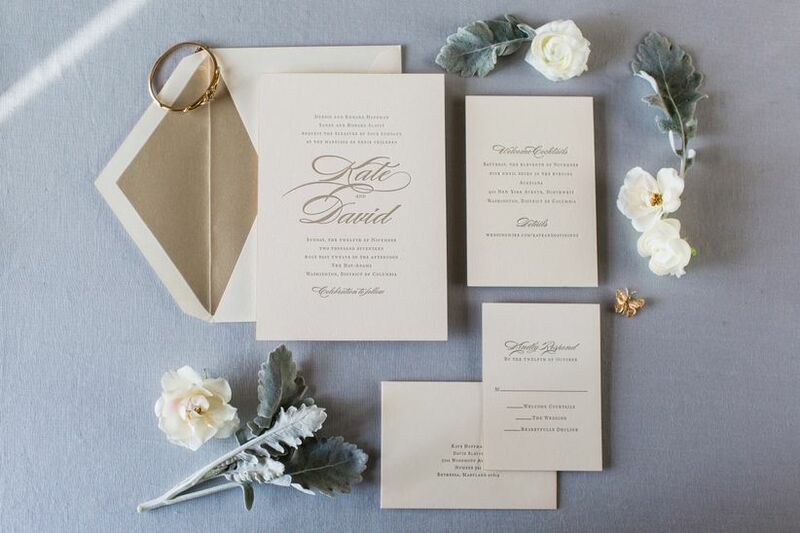 For everyone else, check out these wedding invitation wording etiquette tips. A great way to extend thanks to your and your partner’s parents for covering the cost of your big day is to present them as the hosts on your invitation. Plus, it lets all of your guests know—elegantly and subtly—who to thank when they’re celebrating! The classic way to word this arrangement on your invitations is: “Mr. and Mrs. dad’s-first-name-family-last-name request the pleasure of your company at the marriage of their son/daughter.” If both sets of parents are hosting, the bride’s parents (if there is one!) should be listed first. Of course, you can play with this wedding invitation wording however you like—what’s important is to spotlight your folks' generosity and give a nod to tradition. It’s a big deal if the two of you are paying for your wedding all by yourselves, and you should highlight it as such! 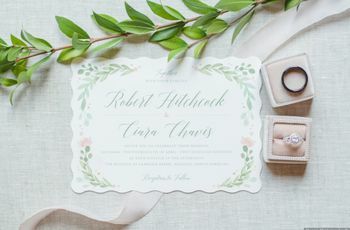 Appropriate wedding invitation wording can be as simple as the bride’s name first, followed by the groom’s name, followed by a form of “request the pleasure of your company”—lets your guest know it’s your party and makes the invitation feel that much more personal and intimate. If you’re two brides or two grooms, go alphabetical—or draw names to see who goes first (wink!). Worried about leaving out your families? Don’t fret—you’ll have plenty of opportunity to put their names up in lights at your wedding, where you can list them on your programs, include them in ceremony decor, and more. First of all, yay for working as a team! Secondly, yay for easiest wedding invitation wording ever! 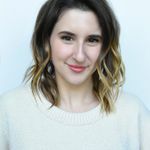 If all of you chipped in to throw your wedding, honoring your parents’ generosity while high-fiving yourselves while sharing with your guests that y’all worked together is as simple as: “Together with their families,” followed by your name and your partner’s name (in the order as determined earlier in this post). This is also a great way to word your invite if you’re just plain not sure who paid for what, or don’t care, but still want things to sound softly formal and want everyone closest to you to be accounted for. One more thing: this is, for what it’s worth, my very favorite way to word an invitation! It’s warm, welcoming and inclusive. 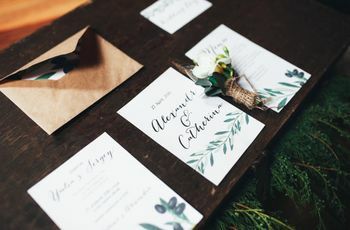 If you want to keep your invitation design airy and minimal, you’re probably after simplicity when it comes to wording—especially if your wedding is going to be a relatively casual affair. It’s totally OK to go simple and write something like, “Name and Name are getting married!” or “Please join us for the wedding of Name and Name!” (You don’t even have to use last names if you don’t want to!) Your reply cards and return address will clarify who exactly is getting married, and, chances are, your recipient will be expecting this invite and know its from the two of you anyway, so going casual and informal is fine—just remember to give credit where credit is due (like, to your parents) at the wedding in some way, since this won’t be taken care of on this style of invitation—and make sure this wording is okay with them before sending the invite. Further, this type of playful wording isn’t recommended for black tie affairs—you’ll want to set that ultra-formal feeling starting with the invites. 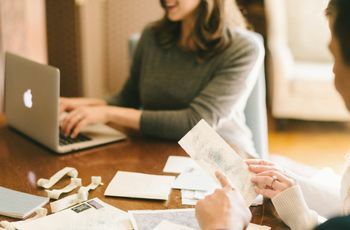 If you are including divorced parents on your invitation, keep each parent on a separate line (and if anyone is remarried, include the stepparent on the same line as their spouse, if you want to). If you’re listing the name of a deceased parent, list as normal, but put “the late” before their name.